North Tahoe’s Max Kelly raced to his second win of the season at Kirkwood Mountain Resort on Tuesday, Dec. 18. 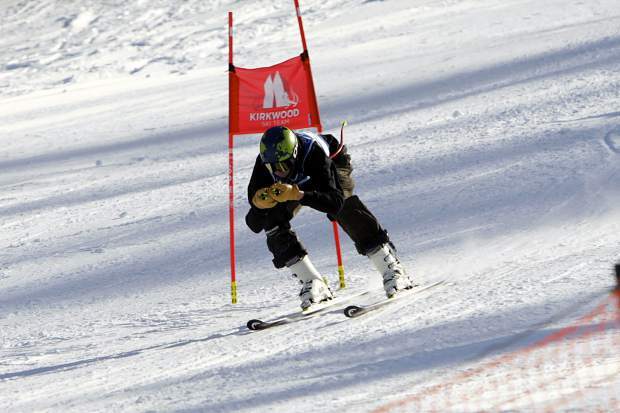 KIRKWOOD — Skiers from Truckee and North Tahoe continued to dominate the slopes in high school racing, sweeping the top five places in the boys and girls’ giant slalom races under excellent conditions at Kirkwood Mountain Resort. The Lakers boys and girls took first as a team in the second round of the Tahoe Basin Ski League on Tuesday, Dec. 18, followed by second-place finishes by the boys and girls’ teams from Truckee. North Tahoe junior Max Kelly was the fastest skier on the mountain for the second time in as many races, skiing to first place with a total time of 48.37 seconds. “The snow is a little dry, it got a little rutted up top, but the bottom stayed smooth and fast,” said Kelly on Tuesday’s course conditions. Kelly was the only skier to break 25.00 seconds in the first heat, and the only to break 24.00 seconds in the second heat. Truckee freshman Jason Roth was second with a total time of 49.70. North Tahoe senior Thomas Mercogliano was third with a combined time of 49.98, followed by teammate’s Oliver Fralick (50.09) and Toby Gajar (51.01). Truckee’s other scoring skiers were Tyler Lamperti (52.95) in seventh, Drew Dolan (55.63) in 11th and Harry Rodriguez (60.87) in 23rd. As a team, North Tahoe picked up their second consecutive victory, scoring 215 points on the day. Truckee was second with 185 points. Incline was third with 158 points. On the girls’ side, skiers from North Tahoe and Truckee put together a dominant showing, finishing with the 11 fastest combined times of the morning. Lakers sophomore Eva Turk raced to her first win of the season, finishing with a combined time of 51.31 to edge Truckee’s Emma Spillman, who finished in second place with a combined time of 51.40. Spillman pressured Turk with a blazing second run, finishing the fastest of any skier with a time of 25.02. Turk, however, responded with a time of 25.30 to hold on for the win. North Tahoe’s Annika Johnson was third with a combined time of 51.80, followed by Truckee’s Susie Greeno in fourth with a combined time of 52.37, and North Tahoe’s Reilly Scott in fifth with a combined time of 52.96. The Wolverines and Lakers dominance through the top 11 finishes continued with Truckee’s Jacqui Roth (53.59), Truckee’s Elsa Pekarek (53.79), North Tahoe’s Ella Carr (55.08), Truckee’s Kelly Critz (55.84), Truckee’s Vanessa Lerner (55.87) and North Tahoe’s Elan Lindsay (58.12). The North Tahoe girls’ captured first overall with a score of 211 to edge Truckee by two points. The Wolverines were without 12 of their 30 racers, according to head coach Patrick Mooney, including last week’s first-place finisher Monique Fellows, and last week’s third-place finisher Whitney Wingard. The race at Kirkwood marked the final high school competition of 2018. Local alpine skiers will next hit the slopes at Heavenly Mountain Resort for the third round of racing, a slalom event, on Wednesday, Jan. 9.